Have you visited downtown Culpeper lately? If not, you should. In the last several years the two main streets in Culpeper have evolved into a melting pot of shops, fine dining, diners, markets and bakeries. The flavors of Culpeper range from Thai to Italian to French and everything in between, all done remarkably well. I have been anticipating dining at Sophie's since I had read the rave review in The Free Lance-Star several months ago. Sophie's is located in the heart of downtown on East Davis. They are open Monday through Saturday for lunch and dinner. I ordered the special of grilled shrimp over baby greens atop grilled flat bread with a dill cream sauce. This dish makes a perfect summer meal, fresh and light. I've tinkered with the dill cream sauce and feel pretty confident that I'm pretty close to Sophie's recipe. You'll see from the photo of my replication that this dish makes for a lovely presentation. Enjoy! 1/2 lb. shrimp, baste with olive oil and seasoned with s&p, Grill 2-3 per side. Set aside. 1 package of Naan (normally found in the bakery section of your grocery store), sprinkled lightly with water on each side and grilled. Cook until crispy. After cooking brush lightly with olive oil. 4 c. fresh baby greens & 1/4 c thinly sliced red onion tossed with 2 tsp. olive oil. 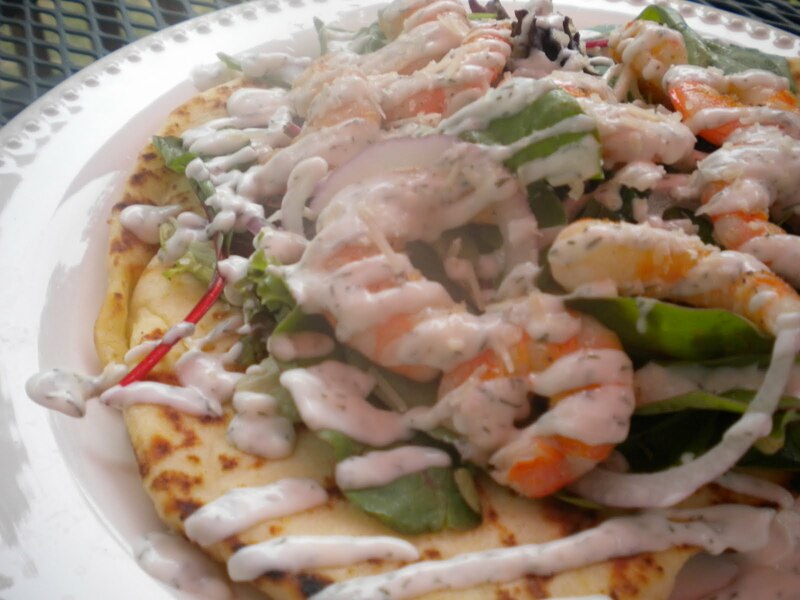 Place the greens atop the Naan, shrimp atop the greens and drizzle with the cream sauce.